Unposted. Taken about 1925. 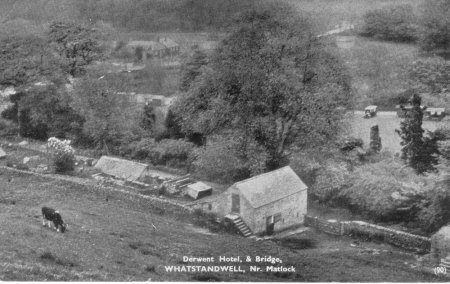 The Derwent Hotel is between the trees in the distance. It is situated between the River, the canal and railway, where the A6 meets the B5035. A nice scene this, a trap pulled by weary horse climbs the hill, equipped with acetylene lamps. Behind, a mother with long skirt and baby in arms. Going down, a workman wearing boots and spats and swinging a mysterious bag. 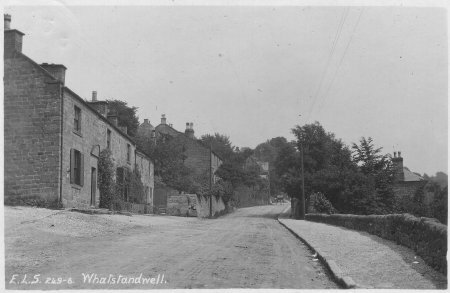 Where does the name Whatstandwell come from? "The explanation of this name is to be found in the 1390 charter which is an agreement between the Abbot of Darley and John de Stepul, the latter intending to build a bridge over the River Derwent next to the house which Walter Stonewell had held of Darley Abbey. The ford there was known as Wattestanwell ford. The same man witnesses charters as Walt' Stondewell in 1347 and Walt' Standewell' in 1350." From The Place-Names of Derbyshire by Kenneth Cameron. 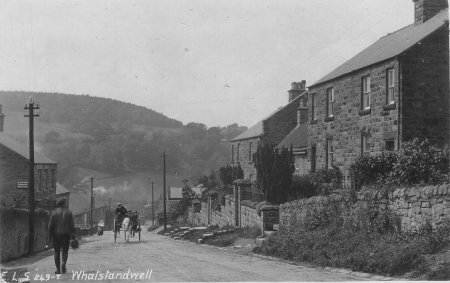 Perhaps Whatstandwell is most famous as the place where Ellen MacArthur, the round-the-world sailor, grew up. Entering Whatstandwell and Ellen in Google brings 342 websites! Congratulations Ellen. Unfortunately, the sign over the door of the nearest house is unreadable. It looks like a Sunday!